Wondering what's wrong with breakfast cereals? I was wondering if you could tell me where to find info about what's wrong with breakfast cereals and why not to eat them? My husband shopped last night and bought Fruity Pebbles! He showed me that it had the same amount of carbs and only a little more sugar than Crispix. Help! I mentioned to him that I was going to ask you but he's not going to be easily convinced. Do you have an article showing research as to why we need to minimize our intake of such empty carbs – especially bleached/sugared cereal? We used to be sugar bomb breakfast cereal freaks around here, too. I even thought they tasted SO good! Now that we know what we know, though, they’ve lost their appeal for Kent and I. Too bad I can’t say the same for our kids. It took years for them to finally give up and stop asking me to buy them! Making things like Fruity Pebbles into those tiny little puffed rice shapes is about as processed a food as you can get, and remember the point is to get away from processed foods and eat more fresh foods as much as possible. The reason is not only because processed foods are soooooooo denatured, meaning they're far from how any food comes in nature, but because the only nutrients in that cereal are synthetic ones that may have been added back in, and synthetic are much less nutritious (obviously) and sometimes even dangerous. It just makes sense that vitamins and minerals the way they come naturally in food are going to be better for us than ones that were isolated in a laboratory. Lastly, when we give our kids these breakfast cereals, which are basically void of nutrition and full of all of those chemicals, we are not only robbing them of the nutrients their bodies need from a breakfast of real food, but we're also training their palate to have to have the sweet, fake-flavored junk that they'll only need to break themselves from later when their health problems start to surface, which they will with that type of diet over the long-term. So basically, when it comes to what's wrong with breakfast cereals, the better question, is there anything good about them? And no, there really isn't! Here are some Healthy breakfast ideas, and add YOUR ideas in the comments over there! And check out this Healthiest Cereal for a Nutritious Breakfast or after school snack! Also, share in the comments here about how difficult it was for you to give up the Sugar Bomb cereals? You may also want to read The Makings of the “Good ol’ American Breakfast” – from a talk by Sally Fallon Morell. And for more info, read about these cereal facts and which ones are the worst of the worst! We live in strange times. Many people consider it normal to get their daily nourishment from out of a cardboard box. One of the foods absolutely banned from my house is breakfast cereal. It costs the body nutrition to digest it. We make our own with our dehydrator-organic nuts, seeds, fruit and gluten free oats. (Sarah) I enjoyed plain cheerios as well. (deep sigh) Why do they have to be so terrible? Hi, was researching GMO’s and realized that GMO’s are used in a lot of these cereals that I have been eating. What is your opinion? 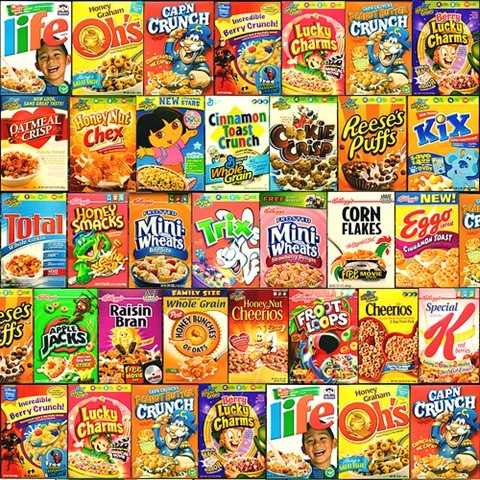 Is it morally wrong that most of these cereals are targeted to our nations children? Absolutely. We haven’t used our food dollars toward *any* breakfast cereals in years. Not to mention that they’re very expensive for zero nutrition. Thanks for your reply Kelly, and definitely post any more info if you find it. You are totally right about the explanation you propose, except that the person I’m discussing this with is my sister in law who works in marketing for a major cereal manufacturer! She is a very nice person but has a very vested interest in believing that the products she markets are healthy! Hi Kelly- I’ve read a lot of the WAPF info against breakfast cereals, and we totally avoid them and make whole, nourishing foods for our breakfasts. However, I am currently trying to explain my perspective to someone and when I reviewed the info about packaged cereals and the extrusion process written by Sally Fallon, I found it less than convincing without further back-up info and sources. So, do you know of any sources beyond the book and unpublished studies she mentions? Thanks! I just tried doing some googling but don’t have time to dig deeper. I’d love to find a good source for the rat study mentioned in the comments! I think that the best way to convince people, though, is just talking about the common sense points in the post and the comments above. Cereals are HUGELY processed and full of junk, it’s really a no-brainer that a nutrient-dense breakfast of pastured eggs and meats or yogurt, etc. would be a much much better choice. I’m guessing plain noodles are just cut and dried, though? Sorry I’m not more help, let me know if you find out more! Kel, cereals aren’t the only foods extruded. What about pasta? I know it’s not soaked, but even if it’s made with sprouted flour, it’s extruded, isn’t it? Help!! My husband must eat gluten free, so I don’t often have many baked goods around. But I when one of my GF muffin experiments didn’t turn out recently, I was reminded of something I used to use for breakfast quite often. Bread Pudding. It can be made ahead and eaten cold or re-heated easily for you husband’s early mornings. Just cube up all your dried ends of bread or baked goods (coffee cake, muffins, etc), or things that didn’t turn out quite right, or even the good stuff and put them in a baking dish. Mix up eggs and milk sweetener of your choice (does not need much), add cinnamon or other spices you like and a bit of vanilla and pour it over the bread cubes and bake. The best way to eat it is to serve warm with fresh cream. Or for more protein make a custard sauce to pour over. Some people like butter melted on top. Or dot the top with butter before baking. Try soaking overnight before baking. Add raisins or grated apples or nuts. For a moister pudding, keep a dish of water in the oven. Lots of variations. My basic recipe calls for 4 eggs, 2 c milk, 1/3 c sugar and 3 c bread cubes, bake until set, 35-40 min. I use that as a starting point and just go from there depending on what I have. The amounts of everything is very lose. You want enough liquid to cover the bread most of the way. If you have more, it will be less bready and more egg/milky, the consistency of a quiche or egg bake. The more milk compared to egg, the longer you must cook it. Or it may not set well all, more like a bread cube porridge. Quinn & Jen, I know it’s good to know, but sometimes I wish I didn’t!! SUCH great comments and info everyone!!!!! You guys are sooooooo awesome, and big ‘ole food geeks like me! LOL! Rebecca, don’t forget to check out the “healthy breakfast ideas” post that is mentioned way up in the post above. Lots of ideas are there. PLUS, now I’m adding Megan’s great suggestion for the make-ahead sausage, egg & cheese biscuits, too! Thank you all for your suggestions. I will have to sit down this week and come up with some things that he can eat. This weekend I made french toast with sprouted bread. He will be reheating this in the toaster and then add on butter and maple syrup. I plan on making the soaked baked oatmeal again. This gives him two to three days of breakfast. Maybe one day he can make a fried egg and toast. There he goes, four days worth of ideas. :o) thanks again. THANK YOU for doing such good research on the sources for info on the toxicity in breakfast cereals! Everyone I know who has cereal and milk (or soy stuff) for breakfast is hungry an hour or two later from the insulin crash and the fact that their stomachs are not full! Cereal is a faux food unless you add stuff to it like fruit and nuts. At that point, why not just have fruit and nuts for breakfast! I’ve been eating Amish sausage and eggs in the morning. I feel much more clear headed and energetic! How interesting to find your posting yesterday was on breakfast cereals. Besides all the above you posted about here’s some more info on why not to buy most store bought cereals and other foods that are Enriched / Fortified. I had gotten an email last night from my daughter for a link about Enriched foods…..what we don’t know about them, what really is put into the foods to fortify them. It was an Eye Opener video by Dr. Levy. It’s posted @ my blog ….www.seedsofnutrtion.wordpress.com June 5th posting titled Enriched Foods Wake Up Call. There is also more info at Dr. Levy’s website about him, his work and under Health E Bytes more info about enriched foods. He has a lot of info on toxicities and has written 6 books and in process of his 7th. He’s a Cardiologist. His work is to show us how to restore our health and remove the toxicities from it. Worth the listening / reading. Kelly, I learned yesterday, what Fortified with Iron realy means. All your readers should check this out. https://www.tomlevymd.com/index.html This site can help verify the video. Also, once you watch this, you may remember all the times various foods have been recalled for metal shavings being found in them. Now you know why! Breakfast cereals are just plain gross. They are made from white flour and white rice that has been processed to death, cooked to death, then extruded from nozzles at high pressure, or literally exploded from cannon type devices (fruity pebbles/rice crispies) Our body was never meant to eat food treated with that kind of heat and pressure. And those colorful dyes in fruity pebbles and fruit loops and any colored cereal are made from PETROLEUM! They actually changed the name of these days back in… well sometime in the past. I don’t remember when exactly. They used to be called ‘petroleum dyes’ but they changed the name to ‘FD&C’ coloring. Pteroleum byproducts are never food. The junk they put in cereal has kept me away from most cereals to start with, but since I learned about the extrusion process they go through, I’ve cut them all together! I know it can be hard having breakfast on the table every morning before the hubby leaves. This is what works perfectly at our house. I make up a batch (12-14 at a time) of soaked, whole wheat biscuits. I then cook a lb of sausage (shaped into patties) from a local farm and a dozen or so free range fried eggs. I then assemble them and freeze (I was really unsure of how the fried eggs would taste after being frozen, but it works just fine). Every night before we go to bed we take one out of the freezer and put it in the fridge to thaw. In the morning he just pops it in the toaster oven with a small slice of cheese and he has a very filling, homemade breakfast ready to go every morning even if I’m not up yet. This has made such a difference for me knowing that I don’t have to get up even earlier than him every morning ( I have a toddler and another one on the way). I know, I know, it would be even better if breakfast every morning involved fruits and veggies; but we’re getting there, one step at a time. 🙂 Hope this helps! By the way, Rebecca, my husband also used to be up and out the door like that in the morning when he was a programmer (we are now opening our own solar business), and he used to take the Amy’s Organic burritos to work and microwave them (ew!). I started getting up really early because I was concerned that he wasn’t getting a good dose of nutrition early in the morning and it was affecting his health to preheat the oven and make him some elk sausages (cook in 20 minutes or less) and boiled eggs. Sometimes we’d vary it a little and he’d eat scrambled eggs if I was motivated to cook that early. Soon we’d start having more elaborate breakfasts and then the whole family was eating together at breakfast each morning, which we hadn’t done in years (on the weekdays). It was great, and I also started soaking whole grains the night before in apple cider vinegar and serving them the next morning (so easy to do). On our cereal we’d have raw milk or yogurt, fruit, maple syrup, and sometimes nuts or raisins, and real butter. Divine! The minimal preparation time in trade for the health benefits was so worth it! My husband used to hate oatmeal, and now we eat it every week day. (Weekends I usually cook something.) For him, the key is changing up the toppings so he doesn’t get tired of it. I was also repulsed by the extrusion process and the rat study, but it’s very eye-opening, and sometimes I think those examples are the things that cause many hard-to-convince people who won’t give it up to finally realize just how horrible it really is! We were eating processed cereal up until as recent as just about 4 years ago. When I first realized I was having trouble with wheat, I started buying an extruded organic amaranth cereal that tasted really great, but even after I would eat it I would still feel terrible and shaky, just like I did with the “whole” wheat cereal. Pretty telling, huh? So for several years we haven’t been eating any cereal at all because I hadn’t realized that soaking was so beneficial and allowed for easier absorption and digestion. Now that I know, I can eat soaked grains for cereals and have no trouble at all. I still avoid eating grains more than two or three times a week, but I’m a Type O and I think that’s why (meat, vegetable eater). I think seeing is believing, and if you just hear it from someone else versus trying it yourself, you are less apt to take it at face value and put it into practice yourself (ah, humans are such creatures of habit and SO stubborn! I know I was..and still am about many things I hold dear). Thanks for posting this Kelly, great as always! Great post! What’s sad is how many fake food cereals pose as healthy. The only boxed cereal I still eat is Grape Nuts (the dense whole-grain content is great for marathon training), but I find myself getting away from even that in favor of less processed foods. Food Renegade is right. Even if you’re buying organic unsweetened cereal from the health food store, it’s still bad for you due to the extrusion. It’s the extrusion process that not only destroys the nutrients but also deforms the amino acid proteins and makes them toxic. I posted about this a while back with quotes from Sally Fallon and excerpts from Paul Stitt’s book, “Fighting the Food Giants”. Stitt is the one who used to work for a multinational food corp and somehow dug up some studies they had done with rats — which of course the company had buried. If you’re hooked on cereals, try reading Potatoes, Not Prozac by Kathleen DesMaisons. Beta endorphin levels are involved. Also, for a real eye opener about what goes into artificial flavors, read the chapter on ice cream in The Milk Book: The Milk of Human Kindness Is Not Pasteurized by William Campbell Douglass II. For the original question — would your husband be willing to experiment with how he feels? Would he be willing to try non-cereal breakfasts for a month and then see how he feels? That might be more convincing than any articles. I went from purchasing the store sugary and colorful cereal to the organic kind for my husband. He is up and out the door before I even think about getting up. What things can I have for him that wouldn’t be cereal that would be fast and easy? Suggestions? He does eat the soaked, baked oatmeal. I know he doesn’t want to eat it every day. The single thing that broke my cold cereal habit was the knowledge of what extrusion does to the grain. (Extrusion is how they transform whole grains into all those wild cereal shapes.) I was so grossed out that I couldn’t ever eat them again. Also, you might remember that study done on rats ages ago where they fed one group of rats the CEREAL and only the cereal and another group of rats the BOX and only the box. The rats being fed the cereal DIED FASTER, by weeks! In other words, the box was actually more nutritious than the cereal inside it. I think the cereal used was cornflakes. I’ll have to find the study again, but a Google search ought to turn it up. Thanks for submitting this to Fight Back Friday today! Does anyone have a source for this study? I keep reading about it, but I can’t find it anywhere to cite. There are references here (https://www.westonaprice.org/modern-foods/567-dirty-secrets-of-the-food-processing-industry) to the man’s book who did the study. My hubby is still hooked on sugary cereals and no amount of cooking delicious, nutritious, whole breakfasts has weened him off yet. He likes eating cereal with his hands as a snack (and who’s to blame him, i used to do the exact same thing!). Im scared that once we have kids, they’ll be hooked right along with him. I think that’s what bothers me most about those new commercials where they show the families having a good time eating the “NEW and IMPROVED!” JUMBO large Rice Krispies cereal. Especially the commercial where the little girl is feeding the large rice krispies to her BABY sister telling her to “Open Wiiiide!” Ugh. Poor baby. I dont ever want my children to get hooked on this stuff. And EW GROSS @ that non-decomposing cake on the side of the road! There is just something comforting about crunchy cereal and cold milk! It brings me back to my high school days when after a bad day at school (lots of those) I’d come home and eat nearly an entire box of cereal with cold milk. No wonder I got sort of chubby in high school! When the crowd of people at school were not nice, my bowl of kix would still be kind to me! I still once in a while like a bowl of crunchy cereal with milk. Even though I have read that even the so called healthy cereals (–those without sugar, flavorings and preservatives) by health minded companies use high heat in the processing–the puffing or extruding of grains. Oh boy. Well at least I am not eating a whole box every day like I used to in the olden days! Through Paul Chek’s “You are What You Eat” audio set (which is AWESOME), I learned about a study done on rats to determine the safety/nutrition of a popular breakfast cereal. One group was fed absolutely nothing, the second group was fed the cereal, and the third was fed the cardboard box that the cereal came in. I recently wrote a pretty thorough article about why sugar and refined carbohydrates are so bad for you. Between the pasteurized milk, especially if skim, the refined grains in the cereal, and the added sugar … yikes! And that’s not even factoring in the potential for dairy or gluten sensitivity! A really interesting test to see if a food is healthy is to dump some of it in nature and see how long it takes to decompose. I once saw a store-bought birthday-type cake dumped on the side of the road on which I regularly take my walks. It was pumped full of industrial byproducts in the form of soybean oil, white flour, and white sugar. There were also lots of radioactive-looking colors. I tell ya, that cake was there, in its basically undisturbed form for weeks and weeks and weeks. Nothing was even attempting to break it down or decompose it. Isn’t that telling!??!?!?! The thing about boxed cereal is that it’s unrecognizable as food, and like Kelly said, completely devoid of minerals, not to mention way overpriced for a penny’s worth of grains!